SOMETHING NEW I've been exploring is keeping a sketchnote business diary on paper, making use of all the sketchnoting techniques I've been developing. Years ago I wrote about using a text file formatted for business journaling, which at the time worked well for my needs. However, some things just don't fit nicely into a text file or even Yojimbo - like quick sketches. I grabbed the Behance Dot Grid journal I purchased a while back, flipped it open and began capturing whatever crossed my mind during my week of work. As it turned out, that included drawings of ideas, URLs, appointments I needed to setup, hex values for my design projects, quotes from podcasts, music and more. Having this blank spread of paper open to me refreshing and fun to use, especially since nearly anything that crosses my mind is fair game for capture. The format of my sketchnote business diary is pretty loose and still being formalized, though I have found dating works well for each day's entries. Note the TIDBITS column on the right for miscellaneous items that I didn't want to include in the main diary area. The subtle structure of the gray dots provides a grid when I want one, but is grayed back and open enough that I can disregard it if I choose to. 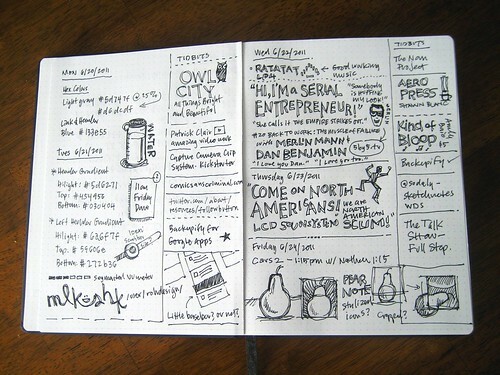 Love the dot grid journal, Mike! Great to hear you're being creative - thanks for sharing!